Hartman Ely Investments is a Development and Investment Company that specializes in Sustainable Redevelopment and Renewable Energy. 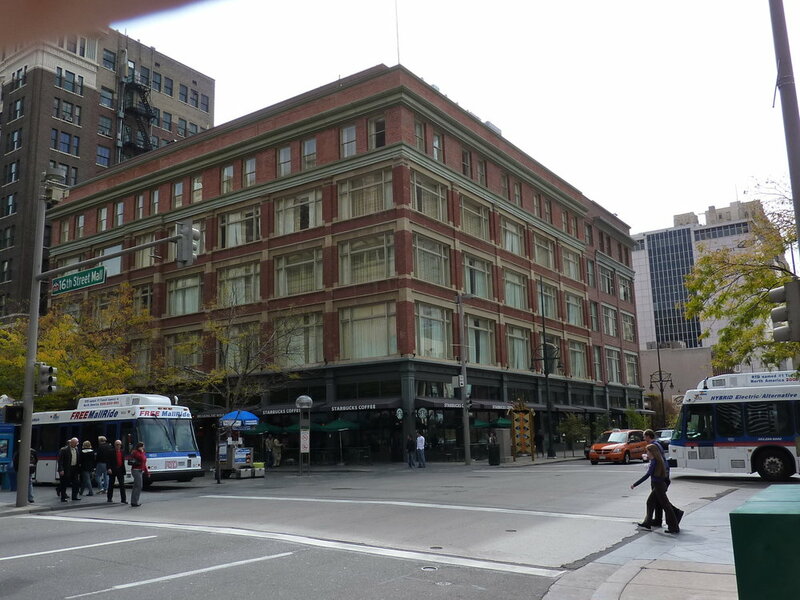 We specializes in transforming vacant historic buildings into vibrant new communities. A key part of our business philosophy is strategic collaborations with partners and surrounding neighborhoods to form a uniquely qualified team for each development opportunity. Our renewable energy developments are solid financial investments that have a seamless aesthetic integration with each building and/or site. Hartman Ely Investments has also created a new LEED Platinum headquarters building, a boutique hotel and other mixed use developments. A public/private partnership between Fruitdale School Partners, The City of Wheat Ridge and The Wheat Ridge Housing Authority created a unique residential community of 16 affordable rental apartments. Historic interior features such as huge operable windows, high ceilings,chalk boards and basketball hoops from the prior school are featured. The entire property is solar-powered and has numerous energy efficiency features to minimize operational costs as well as to provide community education on sustainable development. The site includes a fruit orchard, low-water-use edible landscaping and free electric vehicle charging. Pancratia Hall Lofts is an adaptive use conversion of a vacant classroom and dormitory building at the historic Loretto Heights college campus in southwest Denver. Pancratia Hall is named after Mother Pancratia Bonfils, one of the key founders of Loretto Heights in the late 1800s. It was designed by master architect Harry W. J. Edbrooke in 1927 and was completed in 1930. The transformation of this important historic building will create 65 affordable family apartments and an inviting courtyard. The building's location at the heart of the revitalized Loretto Heights community will provide great additional amenities for residents. Key features of the historic building will be integrated into the new lofts. Decorative terrazzo hallway flooring will be refurbished. The gym will be converted into two, dramatic multi-level apartments, each with its own basketball backboard and restored clerestory windows. The Chapel's stained glass windows, decorative plaster walls, wood timber ceiling and decorative light fixtures will be featured in a dramatic fourth floor apartment. The project will be a public/private partnership with the City and County of Denver, Denver Housing Authority and the Colorado Housing and Finance Authority. Pancratia Hall Lofts is scheduled to be completed in Spring 2021. Pancratia Hall Lofts is a development partnership between Hartman Ely Investments and Proximity Green. Westside Investment Partners is the redeveloper for the entire Loretto Heights Community. Eiber Village is an adaptive use conversion of three vacant, abandoned buildings to 50 affordable rental senior apartments. The original 1960s buildings originally operated as the Hospice of Saint John and this important property was recently designated by the City of Lakewood as a local historic site. The property’s adjacency to Garrison Station along RTD’s West light rail line and it’s proximity to West Colfax Avenue will provide great transit and shopping opportunities for residents. Fruit orchards, enhanced existing gardens, resident patios and solar power systems will be created on the balance of the site. The project will be a public/private partnership with the City of Lakewood, Metro West Housing Solutions and Jefferson County and is scheduled to be completed in Spring 2020. Hartman Ely Investments is Development Manager and an ownership partner with Giving Tree Partnerships. Proposed site plan for Eiber Village at Garrison Station, William Brummett Architects. 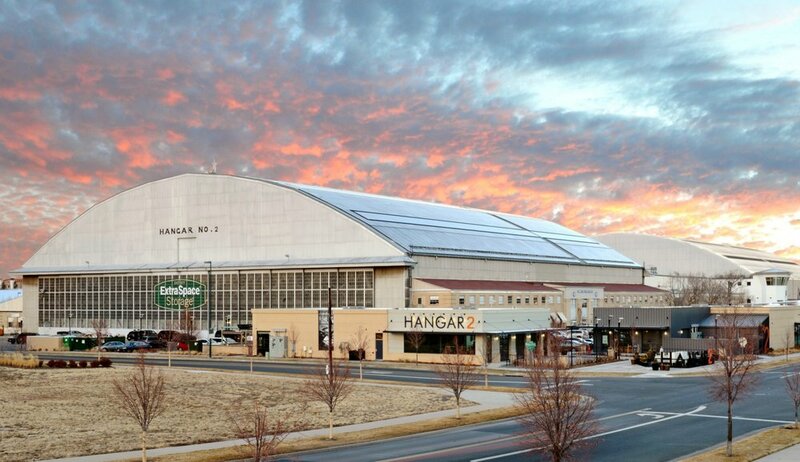 The transformation of the historic 1939 Hangar 2 at Lowry into a vibrant neighborhood meeting place includes restaurants, public art, small entrepreneurial office and retail suites as well as Montessri Casa International School. 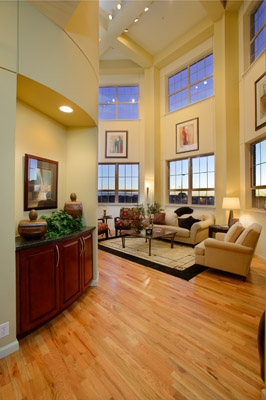 The hangar interior provides climate controlled storage space for Lowry’s homes and local businesses. 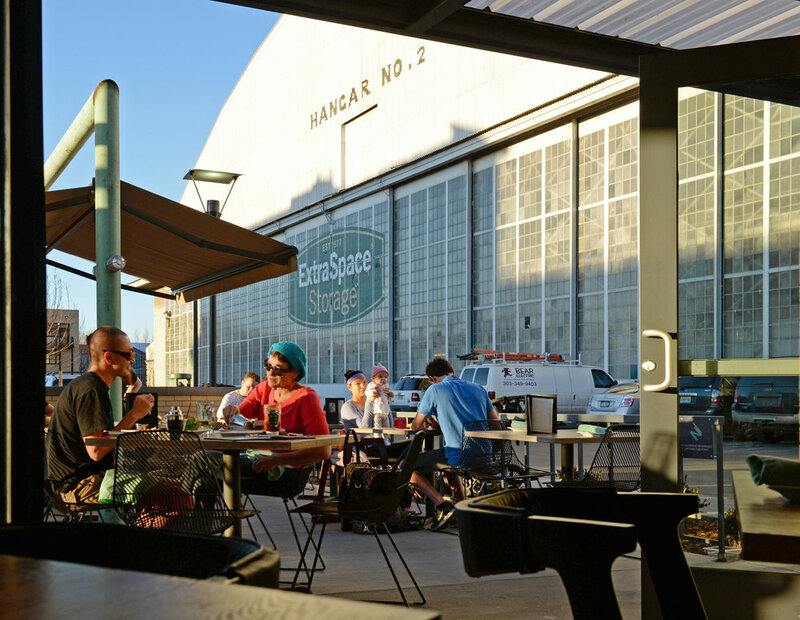 The entire property creates a pedestrian-friendly streetscape and outdoor dining areas connecting the massive historic hangar with the surrounding community. The renovated hangar has a 105kW solar power system for the building and an energy efficient design. It also incorporates a 400kW community solar array allowing solar panels to be purchased by Denver residents to offset their power needs. 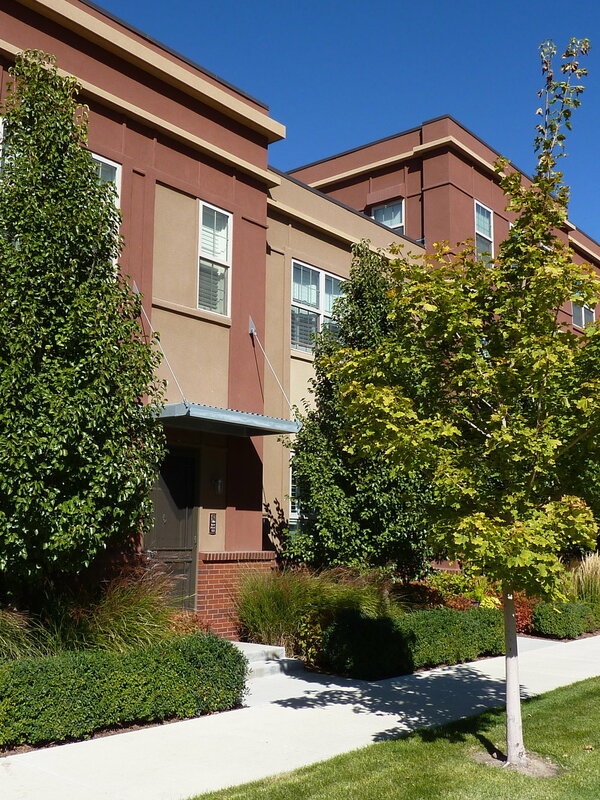 Hartman Ely Investments was Development Manager and is an ownership partner with Larimer Associates and City Street Investors. 2013 Community Preservation Award: Historic Denver. 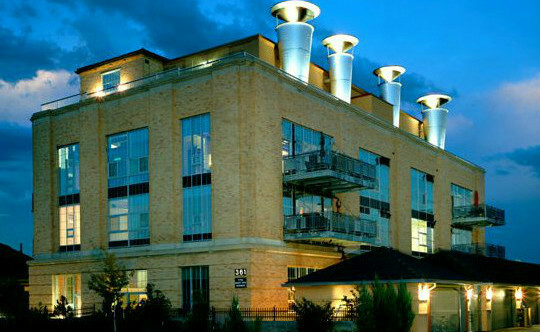 Steam Plant Lofts is the creative conversion of the original "Power House" of the Lowry Air Force Base into 14 custom-designed loft-style condominiums. The overall development also includes 9 single-family Patio Homes that complement the historic Steam Plant building. Steam Plant Lofts has six individual loft solar power systems restoring the building's historic function as Lowry's Source of Energy. Hartman Ely Investments was Development Manager and was an ownership partner with Harvard Communities. Steam Plant Row Homes is a 10-unit townhome building that is the first live/work facility at Lowry. The live/work concept provides a flexible ground floor commercial space with a separate storefront entrance and living space above. The Row Home building is a key anchor of the overall 40-unit Steam Plant Community. 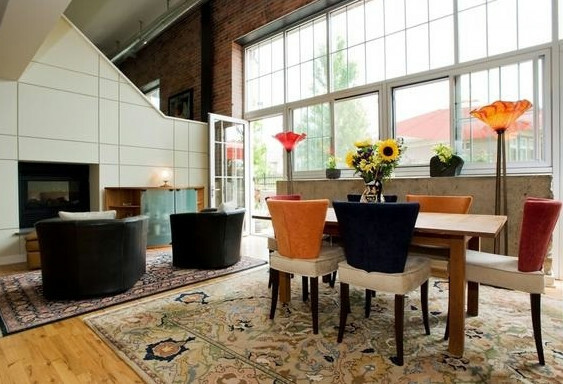 Its design has industrial features and large windows that complement the historic Steam Plant building. InnovAge (previously called Total Longterm Care) is a non-profit, senior care program whose mission is to enable frail individuals to live with dignity in their own homes and communities as long as possible. The Office Facility has many “green” features, including a 111 kW solar energy system that has allowed the facility to achieve a “platinum” LEED rating from the US Green Building Council. The Office Facility uses only 28% of the energy that a typical similar facility would use. 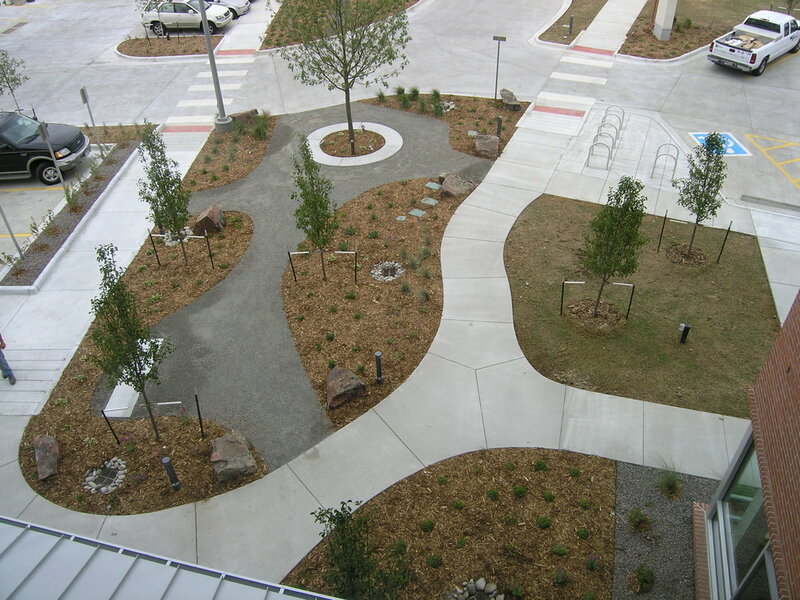 It also has some atypical “green” features such as a fruit orchard in the parking lot and an interior herb/vegetable garden. Hartman Ely Investments was Development Manager and a Development Partner with Heitler Development. The Courtyard Hotel involved an extensive renovation and conversion of the historic Joslins Department Store to become one of Denver's most popular boutique hotels. The project included extensive exterior renovation to remove 1960's metal panels, restore the historic masonry and windows, integrate a 1960's blank wall into a historic facade and add a setback sixth floor. 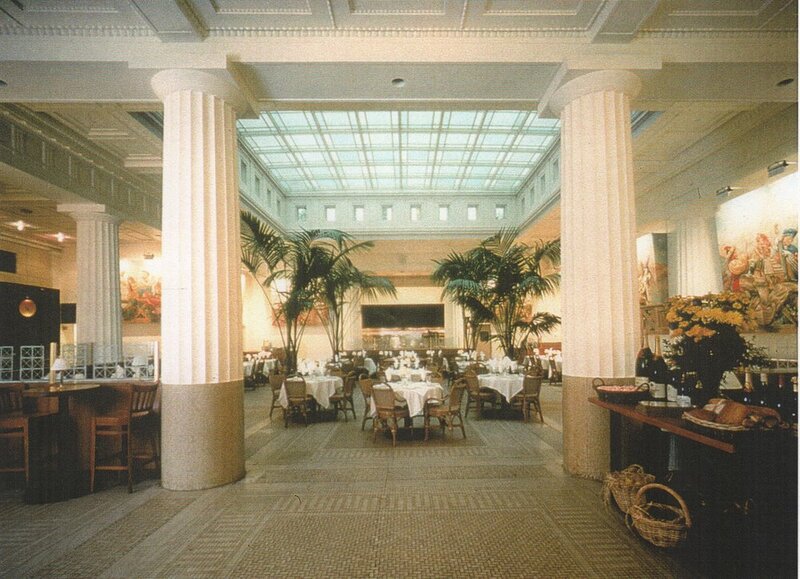 The interior renovation included removal of existing escalators and the insertion of a new atrium, stairs and elevators to convert the department store floor plan to an efficient hotel layout. The Rialto Cafe is a 250 seat restaurant and is the project's main ground floor retail tenant. Jim Hartman was the the Project Architect for Fentress Bradburn Architects. Later in the project he became the Development Manager for National Properties. Hartman Ely Investments was an investor in the project via National Properties. The Boston Lofts is a conversion of the historic Boston Building and Kistler Building into an affordable rental loft community of 158 units with ground floor retail shops. The project involved extensive interior revisions to combine different floor elevations and layouts of two adjacent buildings into one cohesive plan surrounding a restored interior courtyard. An adjacent parking garage was also acquired as part of the project scope. 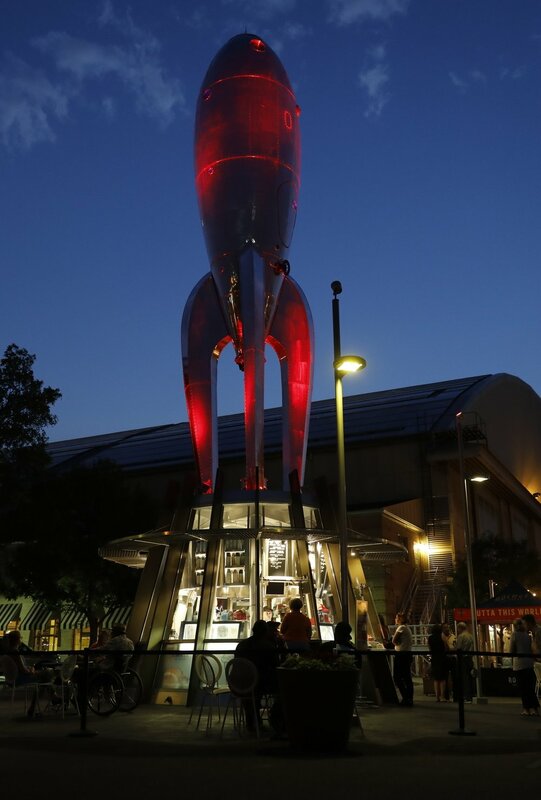 The project was financed with a 40 year HUD mortgage, a grant from the Colorado State Historical Fund, tax increment financing from retail sales from the Denver Urban Renewal Authority, historic preservation tax credits and owner equity. Jim Hartman was Development Manager for National Properties. Hartman Ely Investments was an investor in the project via National Properties. The Bank Lofts is a conversion of the 1921 United States National Bank Building to an affordable rental loft community of 126 units and other ground floor retail tenants, including the conversion of the original banking hall into a Restaurant. The project was financed with a $100,000 grant from the Colorado State Historical Fund, retail sales tax increment financing from the Denver Urban Renewal Authority, historic preservation tax credits, low income housing credits, a 40 year HUD mortgage and owner equity. The solar energy system for the Boulder Wastewater Treatment Facility was the largest solar power system in Boulder County as of 2009. This 1 megawatt system is an important part of the City’s Climate Action Plan and provides approximately 20% of the facility’s power requirements. 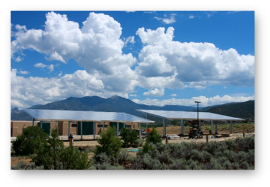 The system is financed using a Power Purchase Agreement (PPA) with the City of Boulder. Financing was achieved during the difficult economic times of late 2008 and early 2009. Entitlements, final design and construction involved complex prairie dog relocation, wetland mitigation and construction phasing. 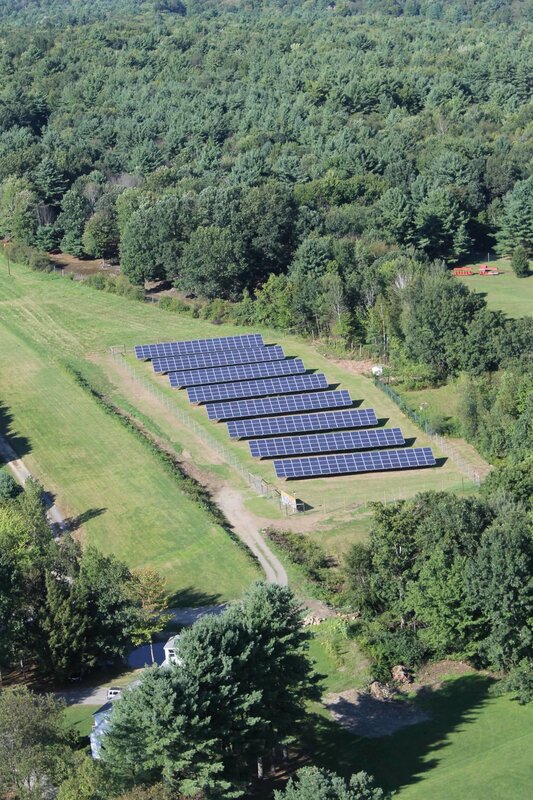 Hartman Ely Investments provided investment capital and project management services for this solar development. Community-owned solar arrays are a unique concept that uses a large, centrally located solar power plant to serve many community members. The array is connected to the community's electricity system and indirectly provides energy for homes, offices, farms and other facilities. Any community member that wants to participate can purchase a part of the array and receive credit on their monthly utility bill for the solar electricity produced by their part of the array. A community solar array provides clean, renewable energy and a hedge against rising energy costs. Clean Energy Collective to bring community-owned solar power to many states and was the Clean Energy Collective's equity investor for the first community-owned solar arrays in Vermont, New Mexico and Northern Colorado.